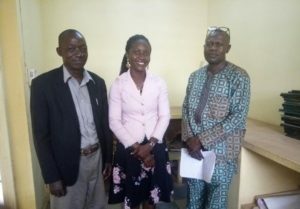 Nigerian National Association for the Deaf (NNAD) Kaduna chapter, on Sunday, July 29th, 2018 declares her support for the indigenous Nigerian Sign Language documentation project scheduled to commence in October in that State after a 2-day training in Abuja. S-DELI’s Head of Research and Advocacy, Mrs. Comfort Anuma reports that the association overwhelmingly accepted the idea of documenting their signed language variety and declared support for S-DELI in the documentation project after they had asked series of questions about the credibility of the organization and the benefits of the documentation projects and were satisfied at the answers they received. 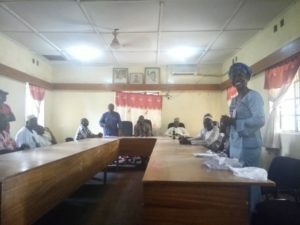 Team S-DELI Kaduna, led by Mrs. Anuma attended the monthly meeting of the Deaf association in Kaduna on the 29th of July to formally inform the association of the signed language documentation project in their state and to administer the questionnaires for the Deaf Documentation project. The association also gladly received the questionnaires to be filled and returned to S-DELI as promised by the association’s president, Mr. Michael Akaka. 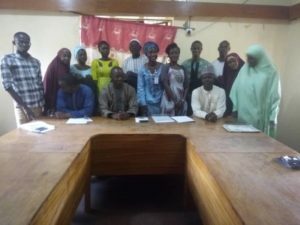 It was earlier reported that three varieties of signed language are in use in Kaduna and among members of this association and this is one of the interests we have in documenting signed language varieties in Kaduna State. 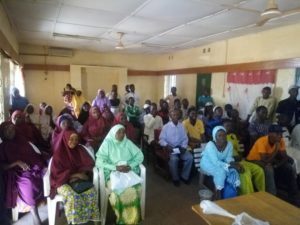 During the proposed documentation project, up to fifteen (15) members of Deaf association in Kaduna will receive training on basic principles of signed language documentation and in relation to their role as language consultants and will work with Team S-DELI throughout the documentation period. Other Deaf community members who have been discovered to use the indigenous Nigerian Sign Language variety will be documented as well. Team S-DELI throws open the opportunity to participate in the training and practicum to linguistics scholars and students across the country so as to expand knowledge in this area of study that is still young and “untapped” in Nigeria.